We were blessed by a quick visit from Dr. Dan this weekend who was in town to run the SB 1/2 Marathon! He told us proudly when we were down for Rudy’s cath that he was going to run in Rudy’s honor so we outfitted him with a “Team Rudy” shirt. We threatened to pull our sponsorship if he didn’t finish…thankfully he performed well and from the looks of the picture he texted us below, he had a good time too. Thanks Dr. Dan! 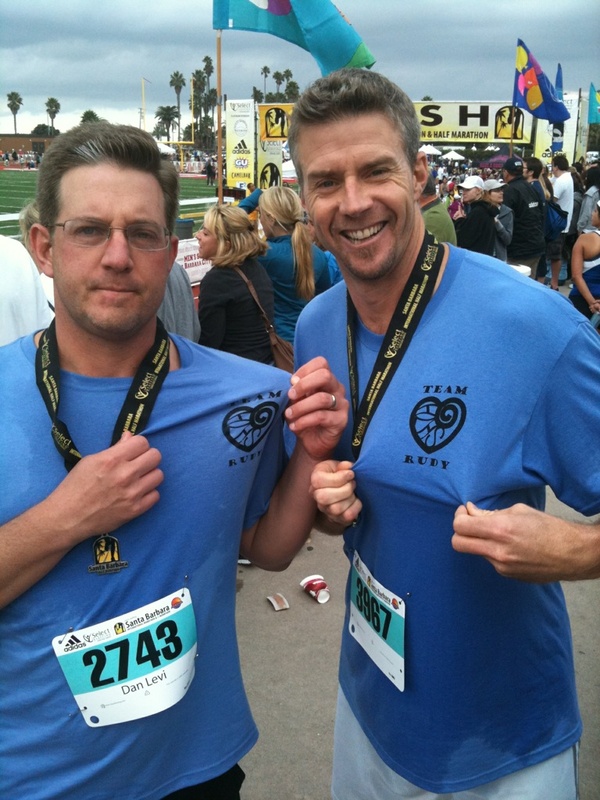 Half-marathoners Dr. Dan and his cousin Pastor Dave running for Rudy! Way to go! Yesterday was Rolf’s and my 18th Anniversary and, ironically, we’ve had a number of people ask us recently how we (as a couple) are doing so I’ve had our relationship on my mind quite a bit lately. 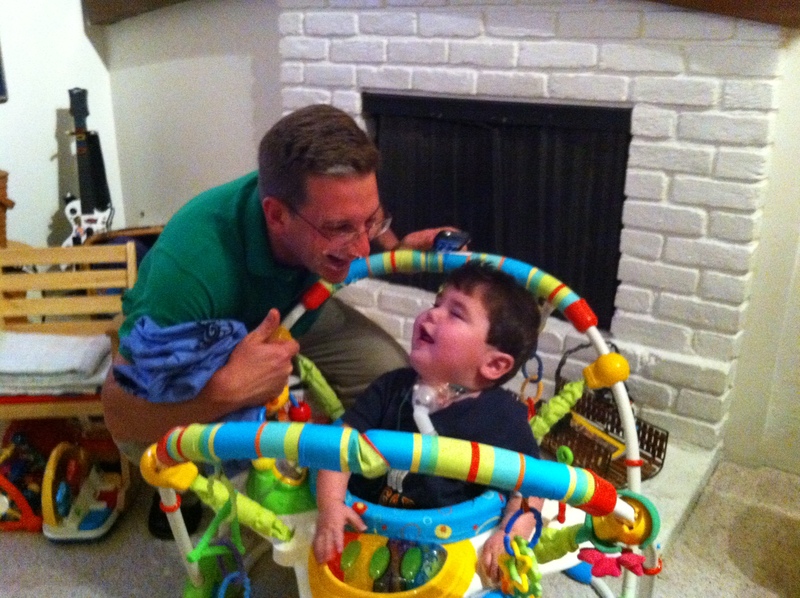 It seems appropriate to share a bit of an update on Rudy’s Beat as this is part of the journey. We’ve purposed to be transparent and detailed in our account of our life with Rudy primarily to encourage people to pray…to pray informed, passionate prayers on our behalf because from the very start we were keenly aware of our inadequacies and our desperate need for God in all this. We’ve experienced an abundance of God’s grace throughout this journey and a good bit of that grace has spilled over into our relationship as well. I think I’ve mentioned it before but Rolf and I do pretty well in crisis…this is by far the biggest life challenge we’ve ever faced together but we have always been good partners in hard times. I’m deeply grateful for this and I don’t take it for granted. We’ve learned over the years that humor and not taking ourselves too seriously serve our relationship well in times of crisis and since Rudy’s diagnosis, we have given each other a pretty wide berth…trying hard to keep the emotions and responses to one another (and the things not done or said) in perspective of the big picture and to not take the negative stuff too personally. This coupled with an occassional “check-in” counseling session has helped us really love each other in this and not turn on one another in fear or pain. This is a good place to be in while navigating crisis but not a great place for any relationship long term. Where Rolf and I are challenged is in our ability to set aside the demands of Rudy’s care and our family to really prioritize each other. We’re so great at “family” but challenged, at times, at “us” and we’re both feeling it. Giving each other “a wide berth” is an expression of grace but gone unchecked too long and that “wide berth” can become an unhealthy distance and we want to guard against that from happening. I wonder how we transition ourselves out of “relationship-survival mode” and into a “new normal” where attention to the details of “us” gets first dibs. Where does the energy and creativity and focus come from when life is at its fastest and most stressful? And so, we pray and ask for continued grace as we seek to grow in our love for each other and make year #19 even better than the 18 before it. Happy Anniversary Rolfi…I’m glad we’re doing life together! Congratulations on 18 years together and especially congratulations on the great job you have done in these past 2 1/2 years. I pray that you have a great 19th year together! Hey there sweet, honest thing – you know I stand ready to help in the small ways that I and my congregation can help you and Rolf make a stab at some time for yourselves. Maybe you need a small council of very close friends to help you brainstorm about how that might happen. Thanks again for your vulnerability – the exhaustion you’re both feeling is deep and long-term, and probably part of your lives from here on in. BUT small stretches of grace and beauty can do wonders for that – both alone and together. Sincerest congrats on celebrating 18 years and heartfelt blessings for the next couple of dozen, too. Love to you both. thank you for your honesty and transparency…the Rudy blog is the first thing I open because of that….I’m sure I’m not the only one who feels “invested” in this journey. and thank you for a new – or another – prayer focus…. Dear Trish and Rolf,Happy Anniversary to you both! 18 years? That is awesome!!! I volunteer my 24 year old niece to help you out on a date night! She lives in Santa Barbara and is studying to be a physical therapist. I suppose I should check with her but I’m sure she’ll be game for the adventure! 18 years? only 2 years before Josh? WOW! Hope you can get to your ‘new normal’ soon! Rudy looks so good. Congratulations on 18 years and GO CARDINAL!!! !